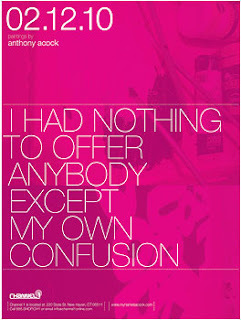 "I Had Nothing to Offer Anyone Except My Own Confusion" by Anthony Acock opens February 12, 2010 in the Channel 1 gallery. This exhibit is the final of a three part series featuring the solo works of local Connecticut artists who have found success in the commercial art world. Anthony works as a graphic designer for the CT Democratic Party at the state capitol. "I Had Nothing to Offer Anyone Except My Own Confusion" is a hodgepodge spread sheet of failed relationships and awkward self defeated friendships. Anthony kept the paintings large, to reflect how largely fucked up a lot of things are in his life. Primarily pink, black, and white. Simplistic as most of his stuff typically is and iconic in nature. Some of his paintings tell a story through abstract images stripped down to their barest essentials, others, just scream the message out, in large, extra bold san-serif type with superman style 3d. This is by far Anthony's most personal work to date, and is a little embarrassing in how much it reveals. Free and open to the public, "I Had Nothing to Offer Anyone Except My Own Confusion" will open Friday February 12, 2010 and run through Sunday March 28, 2010. Exhibit will be open daily Monday thru Saturday 11 - 6pm. For info on the artist check-out is website below. High performance vinyl decal for the fast & furious. 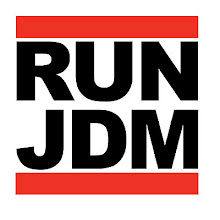 Instant classic amongst the JDM set. Channel 1 was established in 2005 as a lifestyle gallery featuring artwork and products from all genres of independent artists. Our collective of resident artists includes Silas Finch, Sket One, and Demo each creating works sought after by collectors worldwide. We also foster community development through our urban outreach programs. Our mission is to strongly encourage appreciation of the urban arts and skateboarding.